Agilent 11715A AM/FM test source provides very flat, wide-bandwidth, and low-distortion amplitude - or frequency-modulated RF signals. Designed primarily for performance tests and adjustments of the Agilent 8901A/B modulation analyzer and Agilent 8902A measuring receiver, it will also serve as a high-quality modulated test oscillator where its frequency ranges apply. The major components of the 11715A are a low-noise voltage-controlled oscillator (VCO), 2 digital dividers, and a double-balanced mixer. The VCO is the primary signal source, with a typical frequency range of 330 to 470 MHz at the FM output. FM is produced by directly coupling the external modulation source to the tune input of the VCO, providing very wide bandwidth modulation with low phase shift. This design also ensures very little incidential AM. 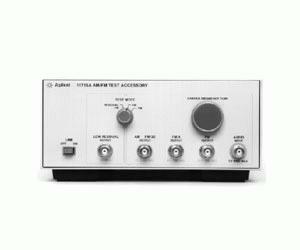 The Agilent 11715A can also be used in conjunction with an 8901A/B and an 8902A as a calibrated signal source for special applications. In particular, the U.S. commercial FM broadcast band of 88 to 108 MHz is covered by the FM divide-by-4 output of the 11715A.